Pigtown is the largest neighborhood in the Southwest Partnership area. Its boundaries are Martin Luther King Blvd and Barre Circle to the east, Pratt St to the north, Carey St, Carroll Park, and Bush St to the west, and the Carroll Camden Industrial area to the south. 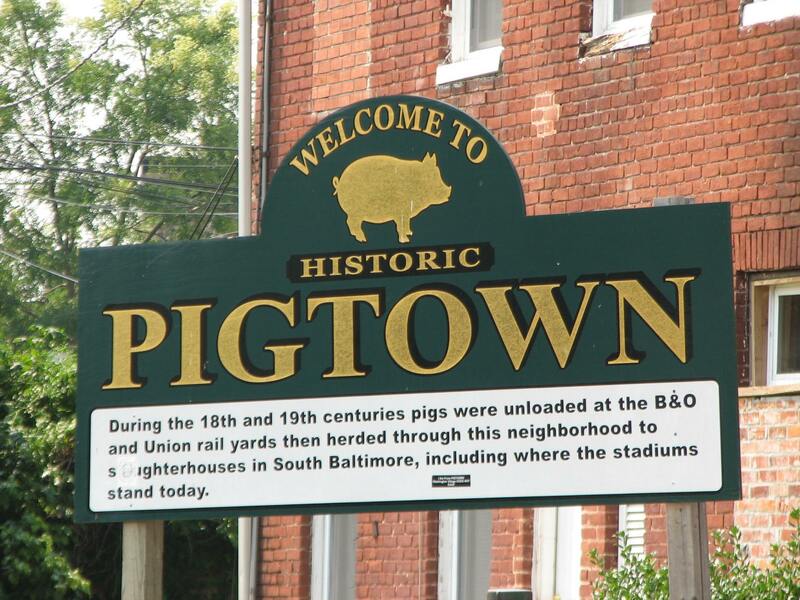 Pigtown is one of the most racially and economically diverse neighborhoods in Baltimore. Convenient to downtown and the Stadium area, its main street, Washington Blvd is a thriving commercial district with a number of small, locally owned businesses. Pigtown also borders Carroll Park, the Carroll Park Golf Course, and the Mount Clare Mansion. Its distinctive name comes from the history of rail in America–pigs that were carried by train to the B&O station were run through the streets of the neighborhood to the slaughterhouses. Carroll Park is the third landscape park in Baltimore, after Druid Hill Park and Patterson Park. It is home to a playground, a number of playing fields, a skate park, and the Carroll Park golf course. The B&O Railroad Museum and the Mount Clare Museum House preserve and celebrate the history of the Southwest Partnership area. The B&O Railroad Museum preserves the history of railroads in Southwest Baltimore and the entire country and the Mount Clare Museum house, located in Carroll Park is the former home of Charles Carroll Barrister. Held every October, Pigtown Main Street’s celebration of the neighborhood brings food, music, fun, and pig races to Washington Blvd. The 15th Annual Pigtown Festival will be Saturday, October 8th 2016. For more than 30 years Paul’s Place has been providing needed services to low income families in Pigtown and the surrounding communities. Paul’s Place offers after school programs, workforce development resources, health care, energy assistance, hot lunch, and other needed programs to individuals and families throughout the area. Charles Carroll Barrister Elementary School serves students in grades pre-K through 5 living in the Pigtown and Mount Clare neighborhoods. Home of the Bears and located across from Carroll Park, CCB has an English as a Second Language program and has a brand new media center courtesy of the Baltimore Ravens. The school’s motto is “Learning Today, Leading Tomorrow” and in 2015 all fifth graders left the school scoring proficient in reading. George Washington Elementary School serves students in grades pre-K through 5 living in Pigtown. Home of the Eagles, it’s daily mission is to ‘provide our students with a high quality education which encompasses Reading, Mathematics, Science, Social Studies, Physical Activity, and Arts’. Students at George Washington participate in programs with Everyman Theater, the University of Maryland Baltimore, Morgan State University, and the Baltimore Museum of Art. Southwest Baltimore Charter School serves students in grades pre-K through 8, Southwest Baltimore Charter School serves students throughout the Southwest Partnership area, basing instruction on the tenets of differentiated instruction, experiential learning, arts integration, and choice theory. Southwest Baltimore Charter School is a site for the UMB CURE Scholars Program which provides mentoring, enrichment activities, and funding for college and graduate school for middle school students interested in health sciences careers. No matching events listed under Pigtown. Please try viewing the full calendar for a complete list of events.